There is nothing like a bit of spring during the long days of winter, and there is nothing as cheerful as a pot of Primrose, they are a pot of sunshine! Primula vulgaris a “spring tease” are now arriving at your local Home Depot in the Northeast, they come in joyful pots that boast bright springtime colors, these little posies are seriously the breath of spring! Pop one on your window ledge they love to be cool and moist, in a bright spot. Boston experience a true spring tease with temperatures reaching into the 60s on Tuesday, while the Patriots celebrated the Super Bowl win and paraded through the city, we all celebrated a taste of spring…talk about Win-Win…. All that and a pot of primrose, it does not get any better than that! 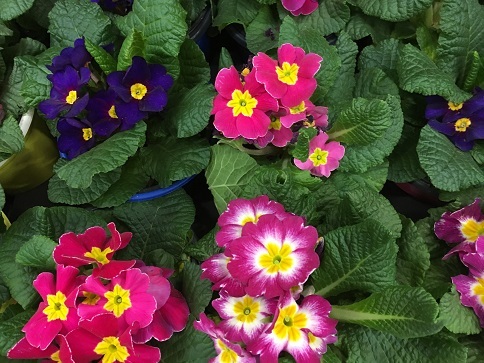 Bring home a true winter winner… a pot of spring, a primrose!